"With some animals—horses, mostly—it has been the habit of Men to name, and keep some account of, a creature’s dam and sire, if only to make a sort of Mathematics of success; a good dam might be joined with a famous sire to make another Champion to win the garland at the next St. Leger stakes. 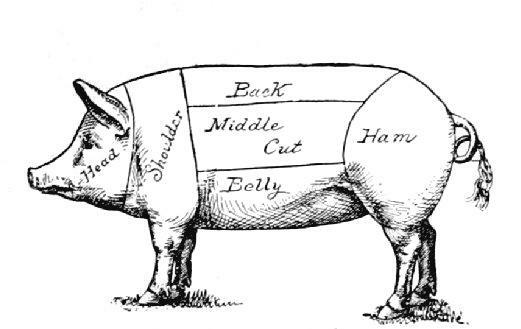 But when it comes to Pigs, men have long felt that there was little sense in naming them, as their only moment of Note was most commonly their being served for Supper, and found more flavourful or delicate than their predecessor—every one of them nameless save by such Ephemeral sobriquets as Loin or Roast. in such a realm of infinite and infinitely replaceable Parts, a row of dinners one after another, the idea of naming any one such meal appeared as absurd as naming a toenail-clipping, or a Fart." When we peruse various cuts of ham and bacon at the supermarket, I doubt that any of us really grasps the enormity, the industrial vastness, that the factory farming of pigs constitutes. The Food and Agriculture Organization of the United Nations estimates that in 2002 that there were more than 939 million pigs on the planet, with 59 million in the United States alone, the majority in large factory farms. Whatever their conditions -- and it's hard to imagine how such large operations could possibly be very "humane" in the broader sense -- that's an enormous number. But of course, by the time the products of this industry have reached our tables, they've been conveniently slaughtered, smoked, shrink-wrapped, and refrigerated, such that they seem more a thing than a creature. And that, alas, is simply a modern, streamlined version of the version of the exact same state of affairs described by Toby, two hundred and thirty years ago. 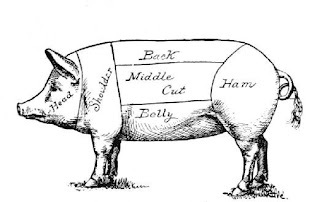 I don't necessarily endorse any one response to these issues, but I'd direct anyone concerned about them to organizations such as Pig Business (UK), Farm Sanctuary (US) or the Humane Society -- or, if the charms of pork prove irresistible, to the Certified Humane or Sustainable Table sites.